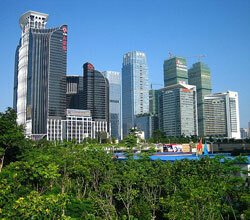 The district of Futian is Shenzhen’s business and administrative centre. While mostly residential, Futian contains important buildings such as the Shenzhen Stock Exchange, the Shenzhen Library and Concert Hall, Shenzhen City Hall and Shenzhen Development Bank—symbols of Shenzhen’s rapid growth. One of the world’s tallest buildings, Shun Hing Square, is also in Futian. It is China’s tallest steel structure.